Description: Tufted annual or perennial to 0.6 m high with dense fine hairs, many of which are glandular, making the plant sticky; culms not disarticulating. Leaves with blade 1–4 mm wide. Panicle 1.5–11.7 mm long; axillary inflorescences absent. Spikelets 5- or 6-flowered, 1 fertile. 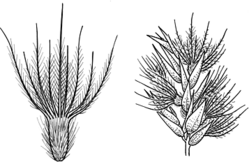 Glumes subequal to unequal, 4–9 mm long, acute or acuminate, entire or minutely erose, muticous or mucronulate, lower 9–13-nerved, upper 5–7-nerved. Body of basal lemma 2–4.2 mm long, nerves slightly ribbed or obscure; awns 2–12 mm long, plumose in the lower 75%. Palea subequal to the lemma. Palea of second floret with broad flaps and almost circular, third to sixth florets reduced, the fourth and fifth florets reduced to lemmas and reflexed or horizontal. 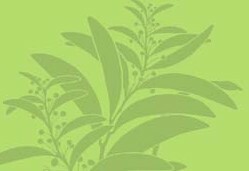 Distribution and occurrence: Grows mainly on sandy or loamy red earth soils, usually in Mulga or Bimble Box communities.